Barbara Harper from Waterbirth International wrote this blog regarding ACOG’s recently published opinion on Water Immersion and Birth in a blog on the website Science and Sensibility. I am relieved to find that Barbara finds this opinion more favorable than the ACOG Opinion from 2014. Morristown Medical Center has been collecting positive data about waterbirth since 2008. Waterbirth has been attended for the most part by midwives but several physicians have also caught waterbabies over the years. The hospital currently has 3 built-in birth tubs and one portable tub and a 4th tub has been ordered. I would not say that water immersion and birth are common at Morristown Medical Center but they are certainly happening. The nursing staff at Morristown Medical Center has become very comfortable with managing women in waterbirth tubs over the past 6 years that the Midwives of New Jersey have been attending births at the hospital. They have had a lot of practice since 75% of our clients use the tubs and about 40% deliver in them. Our OB/GYN department at Morrristown Medical Center is continuing to support waterbirth after reviewing the ACOG statement. 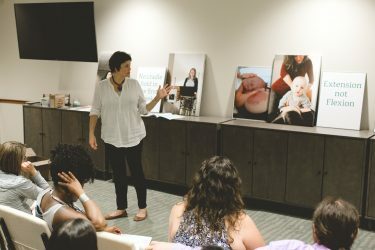 The plan is to change our current study of waterbirth from retrospective to prospective by enrolling women who intend to use the tub ahead of time and giving them proper consents explaining that the safety of water delivery has not been proven safe and beneficial to women and babies as of yet. The consent will detail the possible negative outcomes of waterbirth (Note: there is no evidence that these concerns have any basis at all) and ask women to consent to taking the risk. This is so exciting because OUR hospital and OUR clients will be contributing toward the data that will ultimately prove the benefit and safety of waterbirth! We are asking for you to thank Morristown Medical Center for continuing to support Waterbirth and Midwifery by posting on the hospital’s Facebook page. Tell the hospital about your waterbirth and maybe post a picture of your healthy waterbaby! Whether your baby was born there or not, let the hospital know that you recognize that Morristown Medical Center is a leader in Birth Choices in New Jersey. The Midwives and our clients will definitely benefit from your support.